Scribe SEO is a new age cutting-edge software offering high quality content optimization of web pages by analyzing content of website pages, online press releases and blog post content. It uses plug-technology for all types of wordpress themes. After content is optimized, it has extraordinary solutions for link building at website pages. Scribe SEO helps the webmasters get their website ranked among the top search results on popular search engines like Google, Bing and Yahoo! etc. through its comprehensive and advanced SEO packages. It also tells about how the content of web or blog pages is tweaked in order to attract huge traffic to the website or blog. Official website of Scribe SEO is equipped with all the necessary information pertaining to Scribe SEO. Its website is managed by the creator of Scribe, Copyblogger Media LLC and it has used simple language. Reviews made by the actual users of Scribe help the users know more about this dynamic SEO software. Besides, a demo of SEO Process video lets the users feel the process put into practice by Scribe. Its website also providers an affiliate program for the users to get involved with and earn huge money. Clark Brian is the lead man behind Scribe SEO software process development. He is the founder and CEO of online marketing major Copyblogger Media LLC. Its was the high degree of acumen of Brian in copywriting, SEO copywriting in particular, coupled with passion for SEO that prompted him to develop this effective SEO process software for making search engine optimization a simple process as 1, 2, 3. Brian also took the help of other technocrats like Sean Jackson and Chris Thompson for developing Scribe-API-Technology. Sean made the contribution by developing fundamental theories and framework for SEO technology. Chris, the senior software developer, put in his best efforts for engineering the straightforward and elegant software which can be used within the cohesive framework. *When people talk about what actually they get by choosing Scribe, the straightforward answer is accurate “Analysis” of content and it’s not that easy. With millions of users going for searching using different keywords, analyzing the potentially targeted keywords requires a number of aspects to be considered and Scribe gets full points here for doing so. *With Scribe SEO the webmasters put into best practices based on vigorous keywords research and marketing research. *It has multiple SEO solutions for those not much adept in technological aspects. They often have to face a lot of problems for optimizing their web pages. 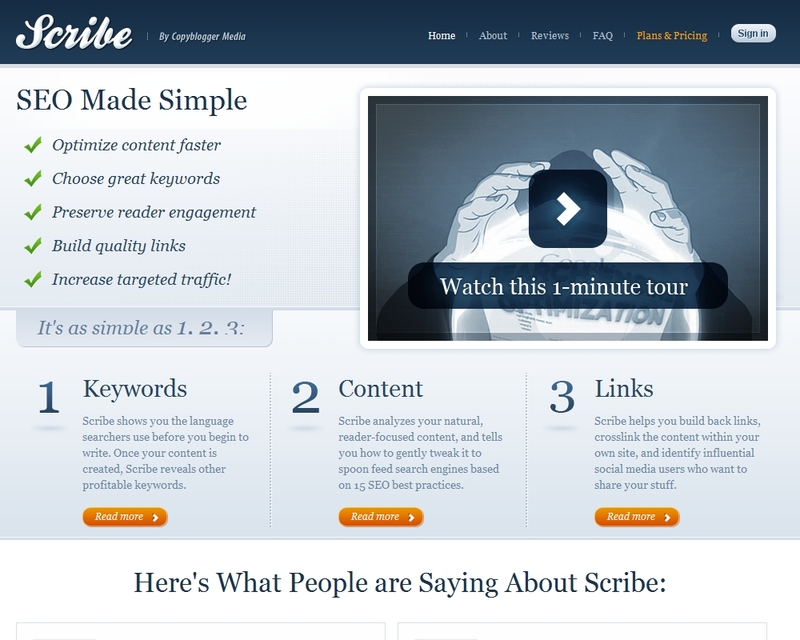 Scribe helps them to know the potential of their blog or web content. *One of the highly admired benefits of Scribe SEO is its faster optimizing speed. 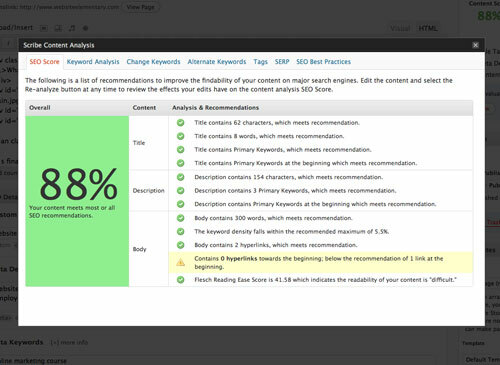 Using analytic tools, it analyzes the content and offers the suggestions for keywords instantly. *It instructs the web content writer how to tweak the content for luring more traffic while maintaining higher quality standards for the content. *Scribe enhances visibility of posts on web thus adding consistent traffic weekly. Even if it has a wide range of benefits, some people also complain of a bit of shortcomings in Scribe. *The first hiccup is that you need to fulfill three conditions for analyzing the content. First, the content should have a title tag. Second, it should have a description and third, content body itself. If these conditions are not met it does not present the content analysis report. *Scribe is not all that is required to get top rankings for the website and its just 20% of Search Engine Optimization. There’s a still a lot to be done besides using Scribe for figuring in the top searches in search engines. It suggests the keywords most searched by users. It prepares the reports on links and tags and suggests the solutions for shortcoming if any. Getting organic traffic for the website is highly feasible for taking the website to rank among the top searches. Search Engines like Google don’t send you anything until content of the website if optimized. Scribe, by the way of integrating with the WP themes assists writers to adopt for the best practices based on analysis of keywords, content and links. Scribe also works effectively with other themes like Joomla, WordPress and Drupal as well. By prompting the webmasters to meet requirements of customized title tag as well as Meta description, it works as an editorial assistant. It optimizes the content on various parameters and presents you an “Analysis Report” which helps you to improvise upon your SEO writing shortcomings. Besides WordPress themes, Scribe also offers effective SEO solutions for Joomla as well as Drupal blog content management systems. Scribe also advices the webmasters as to how they can represent the search engines results in Google so that it is more prompt to draw desired traffic to the website. Scribe analyses the content of blog or web pages and it describes the results in a report which is known as evaluation. Each time the content is analyzed, one evaluation is used and in approximately 3-5 evaluations, a single webpage is fully optimized. However the more Scribe is used the better are the results. Scribe offers different number of evaluation in different packages ranging from 3 to 100 posts or pages. • Content of the web pages is optimized in an effective manner. • It helps you build links which are based on potential keywords. Scribe uses advanced plug-in (API) technologies for optimizing web pages. Its SEO process is elaborated in following steps. 1) Identifying Keywords: First it suggests the keyword using ‘Keyword Research Tool’ and then it tunes the writer to the write the language. 2) Content Creation: Scribe carries out analysis of natural, reader oriented content. Scribe tells you the strategies through which content is tweaked to make feed search engines by applying 15 SEO best practices. 3) Link Building: Scribe lets the user create back links by adding the web pages to other relevant sites. Scribe also helps in creating cross links within the content of master website. Besides, it also searches quality social media users who wish to share your website content on social networking sites like Facebook, Twitter and YouTube. Scribe also works to determine if the title has the right length and contains the primary keyword. It also analyses the length of meta-description as well as content body and notifies you of any shortcomings. this plan involves 300 evaluations per month with 700 keywords searches. It is available up for grab for $97 monthly subscription. It gets facility of 120 evaluations each month with 280 keyword searches. It is available at monthly subscription price of $47. Available at a monthly subscription price of $27, Publisher SEO package offers 30 evaluations each month with 70 keyword searches. Starter: Available at a decent price of $17 and offers 15 evaluations each month with 35 keyword searches. Scribe, with its advanced features and promising potential is much ahead among its peers. Yet a few SEO companies like Flume and Yoodle seem to be offering a stiff challenge to it. Scribe takes into consideration every aspect before it prepares a detailed analysis report. 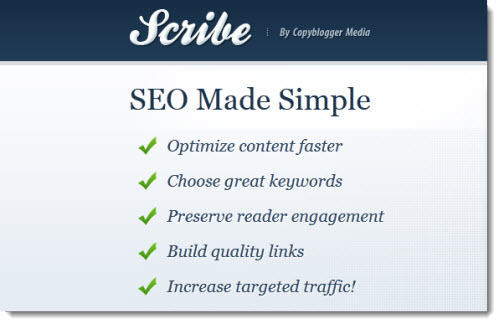 Using Scribe SEO, webmasters put into practice the best SEO practice for web and blog contents. Scribe applies the best SEO practices for optimizing web content and prepares the website for feeding search engines so that search engines like the website and figure it in the top searches. With Scribe SEO, website owners can expect the best ever results. Its ease of use and friendly user interface provides for a powerful SEO software service even for a novice, non-techie user. For those of you looking to achieve higher organic search results, Scribe is by far the best low cost, do it yourself option for you! If preparing dynamic and crisp content is on your mind, Scribe SEO would tell the language and style the writer should opt. This type of value based content gets webmaster values in terms of increased traffic routing to their web pages. It’s the biggest return when a good chunk of this traffic is converted into potential buyers. So, you get the best returns for your investments in Scribe SEO in terms of high reputation and sound financial performance. Scribe SEO Coupons can be used in order to avail attractive discounts on prices of Scribe packages. You can avail discounts ranging from 20% to 50% depending upon the coupon you use. Scribe SEO Promo Code 2012 gets 50% off for purchasing Scribe SEO Plug-in. This promotional code gets the buyers excellent opportunity to save $60 on advanced Scribe versions. It has highest success rate up to 100%.